F. Scott Fitzgerald is famously quoted for boasting that the test of a first-rate intelligence is the ability to hold opposing ideas in the mind at the same time, and still retain the ability to function in the world. He was grossly exaggerating. Living with opposing ideas comes quite easily, even to a child. I learned this when I was eight years old. Perhaps even earlier. Living in a German displaced persons camp until my family's arrival in America two years earlier had wizened me. I can trace this awakening to a specific day and time, in the hour just before Yom Kippur 1952. I was in the synagogue with my father, a European-trained cantor, and a recently become farmer. He and I had started out so early for the Yom Kippur Eve service that Mother was left to wait for the Gentile girl who would mind my little sisters. It was too hot for autumn, even for rural South Jersey. The sun seemed too bright so late in the afternoon. The farm dogs lazed about glassy eyed from the heat, taking no notice of us trudging by them. Father already looked unwell. His robust color had turned to ashen gray, and his lips trembled. I raced to keep up with his long strides. Eyes downcast, he seemed to have forgotten me. It was a long walk for a little girl. Nearly two miles down a narrow unpaved country road to a tiny synagogue that he and other European refugees had built. They named it Sharit ha-Plaiteh for themselves, Survivors of the Holocaust. We walked solemnly, silently and alone. How different this was from our always happy, noisy walks to synagogue. Then the road teemed with other Jewish refugees, converging from all directions into the single way that led to our synagogue. It was the one heartening time that we - a tiny group of Jewish newcomers strewn among the larger Gentile farm population - flowed like a mighty stream. We had come to farming as we had come to America, by default. Displaced from Europe, unable or unwilling to enter Israel, in this peaceful little place, Holocaust survivors like my parents, started over, among each other, because only among ourselves were we sure to be welcomed. We had not yet attained the heroic status among our Jewish American cousins; this would come much later. For now, they remained the willfully forgetful children of much earlier immigrations. It was obvious that our presence was painful to them. I suppose our unimaginable suffering and survival made them uncomfortable. We turned to each other for acceptance, camaraderie, and joy. But not today. Father and I walked alone and in silence. The marshy earth swallowed our footfalls and muddied our holiday shoes. Finally, we arrived, breathless and sweaty. The little synagogue was in all ways European, a simple rectangular building with few windows, its shingles the color of the sandy ground on which it had been built. A few green tufts sprouted here and there amid the weeds and wild flowers. Father kissed the mezuzah on the door post and we entered. Against the left wall, facing east to Jerusalem, stood the bima, a wide platform. The pulpit looked down across rows of wooden pews. Rising behind the pulpit was the only ornate item, a burnished mahogany cabinet. It housed the Aron Kodesh, the Holy Ark, and behind the flimsy curtain stood a single velvet-wrapped Torah, itself a European refugee. It too had been rescued and brought to safety. The ark, the pulpit and the pews had been salvaged from a fire-damaged synagogue in Philadelphia. A curtain strung across the back third of the long room hid the women's section. He and I were alone in the synagogue, as alone as Jews can be in God's house and in God's world. Father mounted the bima and faced the Holy Ark. He stood there for a long time, head lowered, body swaying, his voice muffled. Curious, I drew closer. As I approached him on the bima, I saw that he was crying softly and whispering in Yiddish. I felt my throat tighten. A sob escaped my mouth. Father whirled around, suddenly remembering that I was with him. He hadn't said a single word to me since we had left our farm. I cried out, "What are you doing, Papa?" He looked down to me, his lips still moving silently, not ready to respond. He looked away, sighed deeply, cleared his throat and began. "I apologized to my father," he said. "A Jew must apologize to anyone he has wronged before he addresses the Almighty on Yom Kippur. I begged him to forgive me." Father had filled my head with funny stories about my grandfather of blessed memory. So many light-hearted anecdotes about his childhood in Poland, his adventures as a reluctant but eventually excellent student in Orthodox Judaism, from his early years in cheder, on through Talmud Torah and finishing in the Yeshiva at Krakow. Comical as Father made his recollections, I sensed sadness beneath his chuckles. I could not recall a time when I had not felt this unspoken sorrow. And now I feared that the unspoken was finding its voice. "Papa," I whispered, "What are you sorry about that you have to apologize to Zaideh?" Father hesitated; perhaps he was deciding whether he should share his shame with me. I ran to him, eager to lighten his heart, as he always lightened mine. He looked into my eyes and began to speak. "It was Erev Yom Kippur, 1939. Bombs were crashing all around. The streets were clogged. The Germans were advancing. Inside the ancient synagogue, my father ministered to his terrified flock. He would not leave them, but he pushed me to go. I yelled, I cried, but in the end I allowed myself to be persuaded." His voice broke and he gave a great shutter. "Your grandfather chanted Kol Nidre and I slipped away, fleeing east, to safety." Father turned back to the Holy Ark and intoned aloud what he had only murmured before. "Al chait." "For my sin." He began with the traditional Hebrew words that open to the atonement confessional, touching his fist to his heart. "Father, I beg you to forgive me for the sin I have sinned by joining God in abandoning you." Something important had been passed to me. But what was it? The color flowed back into Father's face. His chest stopped heaving. He was calm. He smiled at me and patted my cheek, then motioned me away. People were arriving. Congregation Sharit Ha-Plaiteh was filling up. I retreated quickly to the women's section and sat next to Mother. Soon Father's clear, strong voice filled the hall. We rose for Father's always haunting rendition of the great Kol Nidre prayer that ushers in the Day of Atonement. I have pondered this enigmatic confession all of my life. I sensed its truth as a child and over the years it has become clear. It captures what Fitzgerald called maintaining opposing ideas, here, ideas about God's qualities and obligations, and our own. 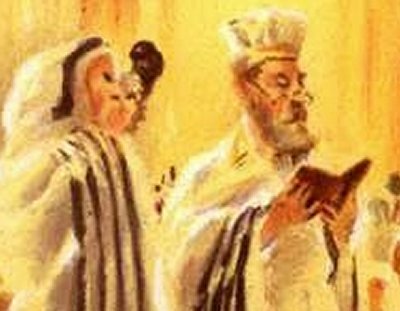 Like my father, we are called to function with dignity as Jews, fallen as the world may be. To call ourselves and our God to account, not in anger, but in humility. Not seeking to know God, but to cling to Him. It is a simple and profound course. It requires only integrity.